Pride of India pampers with exotic flavours from India using subtly spiced flavours and cooking techniques passed down from generations. The menu is all about delicious North Indian cuisine, served in a variety of dishes from seafood, poultry and vegetarian. Try fragrant fish dishes like an aromatic curry cooked in a coconut sauce prepared the Goanese way, or de-shelled prawns sizzled in Indian herbs and spices. Succulent chicken melts in the mouth, cooked in a rich cashew nut sauce, and the tender lamb chops basked in ginger, garlic and tandoori spices is worth a try. Vegetarians are well catered for with an extensive range of dishes such as lentil served with cubes of Indian cottage cheese and dry fruit, marinated in a mild spice or a paneer tikka on a skewer with green peppers, onions, basted with tandoori spices. 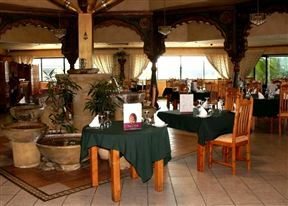 Dine in decadent elegance at Pride of India in Groenkloof. Pride of India is 0.4km from the centre of Groenkloof , the nearest airport 5.7km (Waterkloof AFB Airport).